Diverse adaptive visual processing mechanisms allow us to complete visual search tasks in a wide visual photopic range (>0.6 cd/m2). Whether search strategies or mechanisms known from this range extend below, in the mesopic and scotopic luminance spectra (<0.6 cd/m2), has yet to be addressed. Based on a study that addressed simple target discrimination in luminance environments using contrast-dependent behavioral efficiency functions, we assessed visual search in more complex-feature and conjunction-search paradigms. The results verify the previously reported deficiency windows defined by an interaction of base luminance and luminance contrast for more complex visual-search tasks. Based on significant regression analyses, a more precise definition of the magnitude of contribution of different contrast parameters. Characterized feature search patterns had approximately a 2.5:1 ratio of contribution from the Michelson contrast property relative to Weber contrast, whereas the ratio was approximately 1:1 in a serial-search condition. The results implicate near-complete magnocellular isolation in a visual-search paradigm that has yet to be demonstrated. Our analyses provide a new method of characterizing visual search and the first insight in its underlying mechanisms in luminance environments in the low mesopic and scotopic spectra. One of the most important visual tasks we face is to search for target items among distractors. Many aspects contributing to visual-search performance have been investigated, ranging from basic individual target properties such as color (D’Zmura, 1991), stimulus size (Proulx 2010), or number of stimuli (Treisman & Gelade, 1980), to more cognitive aspects such as attentional control (Eimer, 2015) or memory (Võ, Aizenman, & Wolfe, 2016). Although most of these studies were performed under optimal luminance conditions (photopic viewing spectrum–cone mediated vision), in various, everyday situations, lighting is not (subjectively) “optimal,” but we are still required to process visual information and search for targets (e.g., when driving late at night and following road signs). Diverse adaptive visual processing mechanisms allow us to perform accurately under a wide spectral range; however, adaptation to low luminance does not preclude performance deficits. It is not well understood whether search strategies or mechanisms known from optimal luminance conditions also apply to the low mesopic luminance spectrum (<0.5 cd/m2). Research on visual perception under mesopic luminance conditions typically focuses on the interaction of absolute luminance and luminance contrast as the factors most influential in stimulus processing due to minimized reception capabilities (near complete isolation of conic engagement). Limited to no work has been done examining how absolute luminance of the target and luminance contrast affect visual-search performance under scotopic/low mesopic environments. Only recently, with the use of paradigms using either luminance contrast matching or reaction time (RT) measurements, mesopic luminance functions have been characterized (see Rea & Bullough, 2007; Zele & Cao, 2015, for reviews). A few studies focused on identifying a property of a single target (e.g., stimulus orientation; Landolt C’s—Goodman, Forbes, & Walkey, 2006) or gradient orientation (Lewis, 1998); however, none included assessment of discrimination from other targets or distractors within larger arrays, as one would investigate in visual search. Additionally, as both rods and cones are active in mesopic luminance range, mesopic reaction times for magnocellular (MC) and parvocellular (PC) pathways and are dependent on both the stimulus-surround contrast and the relative sensitivity of the rods and cones at the background luminance, affecting the strength of rod–cone interactions (Zele et al., 2014) adding to the difficulty of delineating each’s contribution. Visual-search paradigms in the low mesopic spectrum may aide in understanding this interaction. Recently, Hunter and colleagues demonstrated a deficiency window and performance efficiency functions for performance accuracy (d’) and reaction time for a simple two-target discrimination task under low mesopic conditions (Hunter, Godde, & Olk, 2016). Participants had to identify a target within a two-stimuli search array with absolute target luminance, luminance contrast, and target eccentricity being manipulated. The principal findings were that a deficiency window could be defined as the interaction of two luminance properties (i.e., the absolute luminance and the internal contrast of the search target), and d’ declined only when both luminance properties were below thresholds of 0.06 cd/m2 for absolute luminance and of 1.7 for the within target contrast ratio. With respect to efficiency functions, we revealed that the product of the internal target contrast (defined as Michelson contrast [CM]), and the contrast between target stimulus and background (Weber’s Contrast [CM]) yielded the strongest prediction of reaction times in terms of a power function. In both instances, the attenuation of both properties was critical for observed behavioral deficits. However, it was assumed that the contribution of the two contrast properties to the behavioral deficits was weighted equally, which may not necessarily be the case. A more robust analysis of the contribution of each contrast property would assist in understanding of the mechanisms involved. Because of our previous study being restricted to a simple two-target discrimination task and simplified analyses, it is necessary to apply similar procedures in a more complex visual-search paradigm to obtain a clearer picture of the hypothesized mechanisms and a more robust assessment of the performance efficiency functions (Hunter et al., 2016). In the present study, we therefore raised the questions (1) whether the deficiency window and the performance efficiency functions described in our previous study (Hunter et al., 2016) could be demonstrated under low luminance conditions also in visual-search tasks of different complexity, and, if so, (2) how the introduced efficiency functions describing the contributions of CM or CW to performance need to be adjusted for these conditions. Visual-search paradigms are typically designed to isolate the contribution of a specific visual characteristic to the performance of the visual search process with inferences being made by varying task complexity. Increased complexity is typically reached by either increasing the number of stimuli in the search array, or the number of stimulus characteristics that are used to define the search target. Thus, we carried out two separate visual-search experiments. In Experiment 1, we varied the set size of the search array maintaining the aforementioned Michelson and Weber contrast values. In Experiment 2, we added a second search criterion hypothesized to invoke a shift from parallel (feature) search to serial (conjunction) search strategies. Previous work has shown that displays that require the identification of a target based on only one stimulus feature (feature search) allow processing of stimuli in parallel. Variation of set size (i.e., by increasing the number of distractors) typically does not affect search rates (reaction time per number of stimuli) in such feature-search paradigms, and multiple stimuli are searched simultaneously (Wolfe, 1998; but see Duncan & Humphreys, 1989, who discuss stimulus parameters that elicit set size effects for feature search). However, this research has usually been carried out in photopic environments and the described phenomena may not hold true in lower luminance environments where the visual perception mechanisms are impaired and can ultimately lead to target perception difficulties (Hunter et al., 2016). Furthermore, even though there is sufficient research on the contribution of luminance contrast to parallel search, respective findings on the role of the parvo and magnocellular visual pathways, are potentially confounded by the fact that they were usually performed under ambient light conditions (cf. Experiment 2). The goal of the present experiment was to fill a gap in research by providing a visual-search paradigm that transitions from the low mesopic to scotopic spectrums expanding off our previous target discrimination task (Hunter et al., 2016). Using the same stimuli, we increased the total number of stimuli to four and 16, aiming to replicate the RT deficiency window, as defined by interaction effects of CW and CM (Hunter et al., 2016). However, in accordance with Wolfe (1994), we expected not to find any effect of set size on RT. Furthermore, we aimed to refine the impact and relative contribution of the center-surround contrast within the target (Michelson contrast; CM - Appendix) and the contrast between the stimulus and the background (Weber’s fraction; CW - Appendix) with linear regression analyses using log-linear performance-based efficiency. These analyses allowed us to better understand the relative contribution of the two contrast parameters to the predictive functions. Participants (seven males, three females, ages 18–21 years, n = 10) were recruited from the local university student population. All participants were provided with compensation of course credits or monetary remuneration. All participants had normal or corrected-to-normal vision. The experiment was conducted in accordance with the ethical standards laid down in the 1964 Declaration of Helsinki. All participants agreed to the participation terms and signed a consent form. Experiment Builder© (SR Research) was used for presentation of the displays and data recording. An IBM computer (ASI0 video card), and a 21-in. CRT monitor (ViewSonic G220F, refresh rate of 70 Hz) were used to display the stimuli. All participants sat with the eyes at a distance of 57 cm from the monitor and placed their chin on a chin rest. The search task expanded on the visual-discrimination task used in Hunter et al. (2016) by increasing the number of stimuli within the array. The same minimal dark adaptation procedures were replicated for this study, where the instruction period doubled as the dark adaptation period lasted approximately 20 minutes. Participants were instructed to judge whether a target stimulus was present or absent in a search array and responded by using the up (present) and down (absent) arrow keys on a standard keyboard with the right index finger. The probability that a target was present was 50%, which was made aware to the participants. Participants received no feedback on their response to prevent learning during the experiment. Each trial began with the presentation of a fixation cross (1° visual angle) at the center of the display for 100 ms followed by a prestimulus interval of 800–1200 ms (randomly generated) and the subsequent presentation of the search array. Participants were allowed to move their eyes once the stimulus array appeared. A trial ended on participants’ response or after 2,000 ms, whichever came first. RT of accurate trials was analyzed. The RT resolution was recorded to the tenth of a millisecond. Targets and distractors were circles with outside diameters of 0.5° and superimposed concentric circles of 0.25°. Both the target and distractor stimuli were implemented as grayscale images. The target always had a higher luminance background (perceived darker center) while the distractors had a darker background (perceived brighter center). Three levels of luminance contrast between the inner and outer circles of the target and distractors were incorporated to assess the contribution of contrast at low luminance levels. The contrast ratios were calculated to standardize the degree of change between the inside and outside circles of the target, consistent with Hunter et al. (2016). Following calculations, three ratio intervals were selected that were centered by the ratio value of the closest approximation of 1.7, such that the interval values were the immediate ratio values below 1.7 (low), closest to 1.7 (medium), and greater than 1.7 (high). Assignment of ratio difference as opposed to absolute luminance value is consistent with methodology of similar literature within the field (Rauschenberger, 2003; Watson & Humphreys, 2002). Two set sizes (4 and 16) were investigated. The target could be present or absent in either a search array of 2 × 2 or an array of 4 × 4 stimuli. For consistency with Hunter et al. (2016), we equated the eccentricities of 6° (for the 2 × 2 array) and 10° (for the 4 × 4 array) covered by the stimuli in the previous study to define the outer boundaries of the present search arrays. The distance between stimuli within each array was always equivalent to 0.5° visual angle. The presence of the target was equally distributed among all potential locations within the array (see Fig. 1 for a graphical representation of the stimuli, spatial allocation, and temporal timeline used of the stimuli in the experiment). All potential combinations between base luminance (B2, B3, B5, B9, B13) and contrast (low, medium, and high) were presented nine times within a block (each block contained 120 trials) in random order. Each block was run twice for each set size (n = 240), for a total of 480 trials. Prior to the beginning of each block, participants completed 10 practice trials per set size. Participants received a 3-minute rest period between blocks. Response time was analyzed for all luminance and array size conditions. Only correct trials within the same response time frame (300–2000 ms) were considered for the RT analyses. To verify the deficiency window for RT as observed in Hunter et al. (2016) as the interaction of both luminance parameters, means were calculated for each condition and entered in a repeated-measures analysis of variance (ANOVA), with base luminance (B2, B3, B5, B9, and B13), luminance contrast (low, medium, high), and set size (n = 4, 16) as repeated measures. For all significant analyses violating assumptions of sphericity, Greenhouse–Geisser corrections to the degrees of freedom were made when necessary. Bonferroni-corrected t tests were done for all post hoc analyses. In a second step, a performance-based efficiency function was defined through stepwise linear regression analyses, with RT as a function of the Michelson contrast CM and the Weber’s fraction CW for all 15 combinations of five base luminance values (B2, B3, B5, B9, B13) and three luminance contrast conditions (low, medium, high). As demonstrated previously (Hunter et al., 2016), the interaction between the two variables proved to have better predictive power than the independent contrast parameters. However, the originally fitted power functions, though highly predictive for the behavioral outcomes, due to the nonlinearity were difficult to interpret. For this reason, a logarithmic transformation was applied to the contrast parameters, resulting in a log-linear performance-based efficiency function (see Equation 1).1 The resulting coefficients (b1 and b2) represent the weighting factor for each contrast property were used for the regression equation (i.e., their relative predictive power) while the intercept (b0) can be interpreted as the inherent difficulty of the visual search condition. with CMi and CWi being the respective contrast values for the i = 1 to 15 possible combinations of base luminance values (B2, B3, B5, B9, B13) and luminance contrast conditions (low, medium, high) and RTi being the resulting reaction times. A 5 base (base luminance: B2, B3, B5, B9, B13) × 3 contrast (luminance contrast: low, medium, high) × 2 set size (4 and 16) repeated-measures ANOVA returned significant main effects for each factor: base, F(4, 32) = 5.18, p < .005, η2 = 0.39; contrast, F(2, 16) = 29.35, p < .0001, η2 = 0.78; and set size, F(1, 8) = 26.57, p < .001 η2 = 0.77. The contrast variable demonstrated significant interactions with both other variables. A Contrast × Base interaction, F(8, 64) = 3.49 p < .002, η2 = 0.30, demonstrated significantly slower RTs observed in the low contrast condition at B2 and B3 values relative to all other conditions, with no significant differences observed between the two (see Fig. 2a). A significant Contrast × Set Size interaction, F(2, 16) = 9.48, p < .002, η2 = 0.54, showed, for the small set size (4), a continual decrease in RT as the contrast increased: Low > Medium, t(10) = 5.88, p < .001; Low > High, t(10) = 6.28, p < .001; Medium > High, t(10) = 2.86, p < .05, while for the large set size (16), RT was only faster at medium and high relative to the lowest contrast, but did not differ significantly between medium and high contrast: Low > Medium, t(10) = 5.50, p < .001; Low > High, t(10) = 3.11, p < .01; Medium > High, t(10) = 0.796, p = .45. In all contrast conditions, RT in the larger set size was slower than its counterpart in the small set size (see Fig. 2b). Stepwise linear-regression analysis, with RT as a dependent variable and the 15 pairs of log-transformed contrast coefficients log10CM and log10CW (5 [base luminance values: B2, B3, B5, B9, B13] × 3 [contrast ratios: low, medium, high]) revealed a significant linear relationship with larger beta coefficients for CM than for CW (−.819 vs. −.538, for log10CM and log10CW, respectively, r2adj = .82, p = .001; cf. Table 1 for detailed statistics). In accordance with the RT results presented above, the equation was then reassessed for each of the two set sizes that also yielded two significant linear equations (set size = 4: r2adj = .68, p = .002; set size = 16: r2adj = .87, p = .001). As illustrated in Fig. 3, for both set sizes, RT increased with a reduction of either contrast value (shift from red/green to blue on both the x and y axes). This increase was again steeper for the Michelson’s contrast CM (x axis) than for the Weber’s fraction CW, particularly for the larger set size. This is also expressed by the higher beta coefficients in the efficiency function (set size 4: −.673 vs. −.611, for log10CM and log10CW, respectively; set size 16: −.882 vs. −.459; cf. Table 1). Results from Experiment 1 confirmed the existence of a deficiency window for RT as reported previously (Hunter et al., 2016): performance decline was only evident in the combination of the lowest luminance contrast ratio (<1.7) with the lowest two base luminance values (B2 and B3, 0.033, 0.050 cd/m2, respectively). Against our hypothesis and findings by Wolfe (1994), we found an effect of set size with slower RT for the 4 × 4 than for the 2 × 2 array, which was also luminance contrast dependent. Whereas for the smaller 2 × 2 array RT decreased with increasing luminance contrast over the whole contrast range, for the larger 4 × 4 array, maximum performance as revealed by shortest RT was reached already at a medium contrast level. In other words, with larger set sizes, the influence of luminance contrast on RT is restricted to the low and medium contrast levels, and once a particular threshold was met, performance did not change further. Calculation of the efficiency functions allowed us to estimate the relative contribution of each of the individual contrast factors to RT. When considering the mean feature search results, it is evident that the center-surround stimulus contrast (CM) contributed to performance approximately 1.5 times more than the absolute luminance contrast between target and background (CW). However, of most interest, when isolating the set sizes, the contribution of the two contrast estimates were approximately 1:1 for the small set size, suggesting an equal contribution, and, a 2:1 ratio in favor of the Michelson contrast with increased set size. Addressing these results from a mechanistic perspective, the two contrast measures presentation parameters may be best described as function of their pedestal presentation (known stimulus presentation parameters designed to target either MC or PC contrast gain; Pokorny 2011). The temporal progression within our paradigm is characterized by an initial contrast perception from the background (i.e., Weber contrast), followed by a secondary stimulus contrast perception after slight adaptation (i.e., Michelson contrast). Our presentation of the Weber contrast would favor a pulsed pedestal presentation (PC contrast indicator), and our Michelson contrast is most comparable to a steady pedestal (MC contrast indicator). While in the small set size condition there is equal contribution of CW and CM to RT in the regression analysis, the significantly greater influence of CM in the larger set size is twice as strong as that of CW, implicating a significantly greater role of (albeit not restricted to) magnocellular processing. From an anatomical perspective, it is important to note that increasing set size or stimulus eccentricity would favor initial rod engagement due to the rod–cone disparity across the retina, subsequently favoring magnocellular influence. Additionally, larger receptive fields are identified as one moves peripherally along the retinal continuum, which could also favor magnocellular processing. Ultimately, we did not replicate the typical lack of effects of set size in feature-search paradigms. However, these findings are important for two reasons: First, we have presented preliminary data supporting parvocellular engagement in visual search processes in the transition of the mesopic to scotopic range, as evidenced by significant regression weights in the smaller set size relative to the (albeit still significant) larger. Second, we have observed that visual-search processes, albeit slower, in mesopic luminance ranges can occur primarily mediated by the magnocellular processing, as opposed to evidence derived from photopic luminance ranges, inferring its primary role as a guide that contributes to visual search. With Experiment 1, we first replicated the deficiency window suggested by Hunter et al. (2016) in a visual-search task with a larger set size than used before. However, while expecting no changes in search time with increasing set size, we observed set size effects that were contrast dependent in the lower end of our contrast spectra. Our visual-search task results and array properties (Experiment 1) mimicked both parallel and serial-search behaviors, but not in the traditional sense (those completed in photopic luminance spectra). We then asked which effects would be observed in search paradigms known to require serial search induced by including two search criteria. An answer to this question could provide greater inference to the prospective involvement of either the magnocellular and parvocellular pathways or both. Visual-search tasks known to require serial search (one stimulus at a time) are normally observed in conjunction-search tasks. These search tasks require to search stimuli based on two or more criteria (Treisman & Gelade, 1980). Increases in set size typically lead to increased reaction times; search rates in serial search (time allocated to each individual stimulus), however, do not change. The nature of the two search processes (parallel and serial) have been actively used to infer magno/parvocellular pathway activation, respectively. Due to its fast temporal integration capacity, the magnocellular pathway has been implicated more as a critical contributor in parallel-search patterns versus serial search, as parallel search favors attention capture related to a faster temporal response (Kandel & Wurtz, 2000: Stein 2014, Skottun & Skoyles, 2008) or, when the search task is varied using luminant versus isoluminant stimuli. Whereas the parvocellular pathway has been demonstrated to contribute more in serial-search conditions relative to that of the contributions of the magnocellular pathway. Despite original presentation of this as a functional dichotomy, it has recently been argued that any distinct discrimination between the visual streams processing occurs at tertiary stages of the rod–cone magnocellular–parvocellular visual processing streams and are not necessarily unimodal. For example, the PC’s response characteristics allow detection of luminance contrast changes in varying achromatic conditions, and, this contrast detection is not necessarily restricted to magnocellular processing as was previously thought. This PC effect may be a function of its linear contrast response function as luminance increases (Kaplan & Shapley, 1986). However, it is difficult to separate the two pathways in mesopic light because of their approximately linear contrast response functions. However, of key consideration in most studies that have assessed visual search is that they are completed in photopic luminance ranges, which innately favor parvocellular engagement. In the photopic luminance range, it may be hard to isolate the magnocellular pathway in a visual-search paradigm, even in high temporal frequencies thought to favor magnocellular processing (Cheng, Eysel, & Vidyasagar, 2004) or known psychophysical conditions designed to isolate gain functions mediated by either’s contrast gain properties (Pokorny, 2011). Considering, contrary to the typical finding of no set-size effects, that, for feature search, we observed set-size effects in our first experiment, the addition of a simple search criterion, targeting known serial search patterns, can further our initial assessment of increased complexity from a simple discrimination task. Additionally, assessing serial search may help elucidate the magnocellular role in visual search, in a low luminance paradigm that favors the low contrast response functions of magnocellular stimuli relative to that of the parvocellular response function (Kaplan & Shapley, 1986). We hypothesized that independent of the contrast properties, we would observe set-size effects (increased RTs with increased set size) consistent with the visual search literature. Additionally, as observed in the 2 × 2 search array in Experiment 1, we expected to observe a similar regression-analysis pattern yielding a proportionally equal contribution of CW and CM to the prediction of behavioral performance in the 2 × 2 search array, while for a larger 4 × 4 array the influence of CM should get relatively stronger. Participants (five male, four female, ages 17–20, n = 9) were recruited from the local university student population. All participants were provided with compensation of course credits or monetary remuneration. All participants had normal or corrected-to-normal vision. The experiment was conducted in accordance with the ethical standards laid down in the 1964 Declaration of Helsinki. All participants agreed to the participation terms and signed a consent form. We created the conjunction-search paradigm with an additional simple characteristic change that was deemed to carry not much additional demand on a higher cognitive level but to be sufficient to produce the complexity needed to elicit results that are consistent with conjunction-search literature (i.e.. increased set size decreases performance—accuracy and reaction time. Like in Experiment 1, participants were given instructions prior to commencement of the study, which doubled as the dark adaptation period similar to Hunter et al. (2016). We used two different set sizes, 2 × 2 and 4 × 4, for our search arrays, like in the previous experiment. The search incorporated square stimuli of the same physical dimensions and luminance properties as the targets and distractors. Thus, both shape and contrast had to be judged to discriminate the target from distractors. The assignment of the luminance and contrast values were held consistent with Experiment 1; however, the B9 and B13 values were eliminated to use fewer levels of contrast, as the results demonstrated no significant differences between the B5, B9, and B13 values in Experiment 1 (see Fig. 2; see Fig. 4 for graphical representation of the stimuli and temporal time line used in the experiment). The experiment was split into two blocks per set size of the array. All potential combinations of base luminance (B2, B3, and B5) and luminance contrast (low, medium, and high) were included, balanced (N = 14) and presented in a random order. Each block contained 126 trials and was preceded by 10 practice trials. Participants received a 3-minute rest period between blocks. Participants performance was recorded as a function of RT. All experimental conditions were analyzed for RT (ms) similar to that of Experiment 1. The only difference between the analysis was that the base variable had two within levels removed (B9, B13), as it was determined that values above the B5 luminance threshold provided no additional relevant information, and luminance should be kept as low as possible. A 3 base (B2, B3, B5) × 3 contrast (low, medium, high) × 2 set (4, 16) repeated-measures ANOVA demonstrated significant main effects for all factors: base, F(2, 14) = 11.45, p < .005, η2 = 0.62; contrast, F(2, 14) = 14.32, p < .005, η2 = 0.67; set, F(1, 8 ) = 70.32, p < .005, η2 = 0.91. A Contrast × Base interaction, F(4, 28) = 2.63, p < .05, η2 = 0.27, was observed, demonstrating significantly slower RTs in the B2 and B3 conditions relative to the B5 only during the low contrast condition: Low B2 > B3, t(10) = 0.48, p = .61; B2 > B5, t(10) = 4.64, p < .01; B3 > B5, t(10) = 3.48, p < .05, all other t-test comparisons were not significant) (Fig. 5). Stepwise linear regression analysis, with RT as the dependent variable and the nine pairs of log-transformed contrast coefficients log10CM and log10CW (3 [base values: B2, B3, B5] × 3 [contrasts: low, medium, high]) as regressors revealed a highly significant linear relationship with nearly equal contributions of both contrast parameters (−272.2 vs. −223.5, for log10CM and log10CW, respectively, r2adj = .857, p ≤ .001; cf. Table 2 for detailed statistics). The equation was then reassessed for each of the two set sizes that also yielded two significant linear equations (set size = 4: r2adj = .77, p = .005; set size = 16: r2adj = .81, p ≤ .001). Again, as illustrated in Table 2, for both set sizes, both contrast parameters contributed nearly equally to performance (set size 4: −.626 vs. −.667, for log10CM and log10CW, respectively; set size 16: −.675 vs. −.672; cf. Table 2 and Fig. 6). With Experiment, 2 we again replicated the deficiency windows for RT, where participants’ decline in performance was not sensitive to a decrease in only one of the two luminance properties but were found to be the combination of when values fall below 0.06 cd/m2 (B2 and B3) coinciding with a low luminance contrast ratio (<1.7). Consistent with our hypothesis and the nature of the targeted conjunction search paradigms, the participants’ performance was affected by the increased number of search stimuli, culminating in main effects of slower RT with an increase in set size. Performance-based efficiency functions revealed approximately equal contribution of each contrast measure, suggesting equal contribution of both magnocellular and parvocellular streams as inferred from Experiment 1. In the next section, we discuss this issue by comparing both experiments. Experiments 1 and 2 examined incremental increases in complexity, as defined by the increased number of stimuli (feature search relative to the target discrimination observed in Hunter et al., 2016) and by the type of search required (feature search vs. conjunction search), respectively. As we were interested in the direct contrast between the two different search paradigms, we compared the data of both experiments’ RT efficiency functions, focusing on (1) the magnitude of difference and slope trends between the search conditions for each respective set size, and (2) the proportional similarity in contribution of each of the respective contrast coefficients to the previously observed contrast functions (see Tables 1 and 2). For the latter, we calculated an integral for each individual contrast property within each of the four different search conditions based on the previously reported regression equations (see Table 1: Feature 4, Feature 16; Table 2: Conjunction 4 and Conjunction 16) and plotted their respective values against each other. The integral calculations isolated each contrast property by adding a zero multiplier of the opposing contrast property, then calculating the integral for the minimum and maximum values used by each of the respective coefficient variables in the experiments (see Equations 2.a and 2.b). Michelson contrast equation slope, c = constant, values located in Tables 1 and 2, for each respective search condition. Min and Max log10CM = −0.8 and −0.3, respectively. Weber contrast equation slope, c = constant, values located in Tables 1 and 2, for each respective search condition. Min and Max log10CW = 0.6 − 1.6. Figure 7 summarizes the results from Experiments 1 and 2 with respect to the contributions of CM and CW to RT in the performance-efficiency functions. Surface planes for the four conditions (Feature 4 and 16 from Experiment 1 and Conjunction 4 and 16 from Experiment 2; Fig. 7a, b, d, and e, respectively) reveal the proportional contribution of each contrast parameter to RT. Three conditions (Feature 4, Conjunction 4, and Conjunction 16) reveal a similar gradient with increasing RT from bottom left to upper right (i.e., a similar linear increase of RT with either of the contrast parameters). A different pattern can be seen for the Feature 16 condition, where the slope along the x-axis (i.e., for the Michelson’s contrast) is much steeper than for the Weber’s fraction (y-axis), indicating a stronger influence of change in CM compared with CW on changes in RT. This impression is supported by the difference plots (Fig. 7c, f–h). The contrast integrals plot (Fig. 7i) also demonstrates the contribution bias of the Michelson contrast for the Feature 16 search condition, while all other conditions are approximately completely linear in their plotted values. It can be easily seen that a shift from feature to conjunction search within the same array or from small to larger set size in conjunction search does not change the equal contribution of CW and CM to RT, while feature search with larger set size leads to much stronger weight of the Michelson’s contrast. With the present experiments, we first aimed to extrapolate on our previous work on visual-target discrimination (Hunter et al., 2016) to visual-search performance as a function of increased number of stimuli in the low mesopic luminance range. In Experiment 1, we first replicated the deficiency window providing a spectral and contrast-dependent threshold where one can expect decreased performance; however, our hypotheses that reaction times should be independent of set size in a feature-search condition was not supported. We further quantified these findings, providing a more robust performance-efficiency function, than was presented earlier in Hunter et al. (2016), that allowed evaluation of the differential contribution of the Michelson contrast and the Weber’s fraction on performance under different task conditions. A clearly stronger contribution of the Michelson contrast was observed for the larger set size (16) in the feature-search condition and is consistent with the demonstrated deficiency window. Further extrapolation on the interpretation of the findings in Experiment 1 was completed with a conjunction-search paradigm (Experiment 2), and was successful in both (1) replicating a similar deficiency window for RT and (2) observing set-size effects that are typically seen in serial-search patterns elicited from conjunction-search paradigms. The obtained efficiency function supported the notion of an adopted serial-search pattern, with an approximately equal contribution of explained variance for both contrast properties. Herewith, the Weber contrast would be important for defining the contrast between target and background, with its presentation on the display being most similar to a steady pedestal behavioral task, whereas the Michelson contrast would be critical for inner-target contrast,with its presentation on the display similar to a pulsed pedestal task. Concordantly, when considering intercept weights in the regression equations as inherent task difficulty, in Experiment 1, even though weights were lower than those for the smaller set size in Experiment 2, RTs were slower. This suggests greater influence of the Michelson contrast in determining search times in feature search. In Experiment 2, the intercept magnitude, that is, task difficulty and thus RT, was proportional to the number of stimuli, and both contrast properties contributed equally to search performance. This suggests that in Experiment 2 the relationship between task difficulty and contrast contribution was independent of set size, unlike what was observed in the feature search paradigm of Experiment 1. While the results from the feature search show set-size effects, search performance at the larger set size primarily depends on the Michelson contrast. This finding supports the notion of a greater involvement of the magnocellular processing pathway within this luminance spectrum. As noted before, involvement of the magnocellular pathway in visual search has been reported more at the cortical levels while it could be also due to the increased receptive field sizes at more peripheral retinal locations. Alternatively, the potentially increased activation of the magnocellular cells in the larger set size of the feature-search paradigm could have influenced the parvocellular contrast detection. Lateral rod–cone interactions have been reported for low luminance levels (Cao, Zele, & Pokorny, 2006), which could have led to decreased RTs. Three issues that need to be addressed in future studies, to confirm our findings and interpretations, are (1) instruction of visual-search pattern or verification of visual-search pattern, (2) type of search stimuli, and (3) neuroimaging of the cortical processing to better elucidate involved processing pathways and stages. Considering both first and second issues, (1) participants were instructed to search ad libitum. It was not possible to determine the magnitude of distance that was scanned in each trial effectively determining retinal eccentricity; however, it can be confirmed that initial fixation was centered. Also, participants could have subjectively placed more or less emphasis on either contrast measure. If one were to focus on the inner ring of the annulus first (favoring the Michelson contrast), this could produce similar results, as we have observed in our targeted-feature search for the large set size. Whereas instructions to favor the outer annulus ring could shift the weighting functions to favor the Weber contrast. (2) We must recognize that our conjunction-search paradigm incorporates shape discrimination (square or circle), which is a task well known to be highly mediated by the parvocellular pathway. 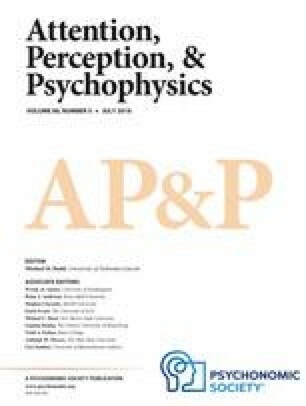 This study has provided multiple novel findings that include both new behavioral perspectives on how we use visual search mechanisms in scotopic–low mesopic luminance spectra luminance environments that we must adapt to daily, and a novel way of quantifying and defining what is considered parallel or serial search behavior. We have verified the previously reported deficiency window in more complex visual-search tasks and have provided a more precise definition of the magnitude of contribution of different contrast parameters. We have also demonstrated that the absolute value of these contrast variables can dictate the type of search patterns being used, which has not been previously shown. Further studies from an eye-tracking and neurophysiological perspective will help to truly delineate the search pattern and contribution and engagement of visual pathways being used in our everyday search mechanisms, respectively. We also applied the power function with CMW (the product of CM and Cw) as the predictor as done previously (Hunter et al., 2016). However, predictive power of the log-linear analysis was higher and thus used here. The authors would like to acknowledge funding support from the German Academic Exchange Service (DAAD) and the Cognitive Systems and Processes (COSYP) research center at Jacobs University Bremen. Michelson’s contrast is utilized to assess a contrast gradient of a sinusoidal pattern (Equation 1). Contrast (CM) is the ratio of the difference between the maximum and minimum luminance to the total luminance (C belongs to a range of 0 to 1) of the gradient. Given the alternating contrast of the target (target = light – dark – light, distractor = dark – light – dark), at this reflects a contrast gradient in which we assign a contrast rating verified in Hunter et al. (2016). Weber’s fraction (CW) reflects the contrast between a single stimulus and its surrounding background luminance (Equation 2). ΔL is the incremental change in luminance of the target relative to L, which is the background luminance. L was = 0.001 cd/m2 avoiding zero assignment as the denominator. For target present conditions this was reflected by the outer annulus value and for the target absent conditions this was reflected by the inner annulus value.